When Kate Gerwig, my wonderful editor from SearchTelecom.com, and myself agreed on the contents of the “Building customer-resilient BGP networks” article, we had no idea that it would become extremely relevant just days before it was published. The article describes the tools a Service Provider should use to ensure that its customers cannot harm its BGP routing data (and consequently its other customers and the Internet at large). On February 24th, someone in Pakistan decided to block local access to YouTube … and someone else decided that the best way to approach the problem was to block the whole world’s access to YouTube. YouTube (AS 36561) advertises its networks as nicely aggregated IP prefixes (one /20, one /22, one /19 and one /24). The hijackers decided to block the /22 range by announcing more specific (/24) prefixes. Their upstream provider had no filters in place and accepted these prefixes (BIG mistake). They soon propagated throughout the Internet, until someone in YouTube noticed them and started originating the same /24 prefixes. The timing and sequence of events is outlined in the Renesys blog. Full in-depth analysis including an animation of the BGP changes is posted on the RIPE NCC web site. Since YouTube is way better connected to the major Internet providers as the offenders, from most points in the Internet the AS paths of the YouTube-originated prefixes were shorter than the ones the hijackers used, resulting in corrected routing. Ten minutes later, YouTube started announcing even more specific prefixes (/25) that completely restored connectivity to their servers. I’m just guessing that someone had to remove the usual filters that drop the /25 (and longer) prefixes from being accepted from the customers in the meantime (Good work!). The big debate people are having these days is: “can anything be done to stop this”. Of course there is a solution: major Service Providers use Internet Routing Registries and document their autonomous systems, routes and routing policies (and every AS should be doing the same). However, the solution is not enforced globally and while some Service Providers use the registries to build filters for their customers, no-one is willing to pull the plug and implement the filtering policies on all ingress/egress points. Unfortunately, you cannot implement the IP prefix filters on major exchange points, as there’s no reasonable way you could download the prefix lists covering the full Internet routing table into the routers and filter hundreds of thousands of IP prefixes. The last chance to implement the filters is on the regional level. To get a better perspective of the problem, compare the entry for AS3491 (PCCW Global, the upstream provider that propagated the fake Pakistani route) with the entries for AS 3356 (Level 3) and AS 3561 (Savvis) … and allow me to refrain from commenting what you see. The list of all articles I wrote for SearchTelecom is available in the CT3 wiki. You should not configure no peer neighbor-route on the router that gets dynamic IP address, as the subnet mask is not assigned with IPCP; you need the IPCP-generated host routes if you want to do hop-by-hop telnet between the routers. Petr Lapukhov describes an interesting scenarion in his post BGP Time-Based Policy Routing: a multi-homed customer that uses one upstream link (for example, more reliable but slower one) during the work hours, switching to the other upstream link (faster, less reliable) after that. He uses BGP communities to achieve the switch (perfect solution if your ISP supports them) and time-based ACL in a route-map to set the community based on time-of-day. As Cisco changed the way BGP imports local routes in IOS release 12.3T, he then devises an ingenious solution based on reliable static routing to trigger a change in the IP routing table. event timer cron name "WeekdayStart" cron-entry "1 9 * * 1-5"
action 2.0 cli command "clear ip route 172.18.1.0"
event timer cron name "WeekdayEnd" cron-entry "1 17 * * 1-5"
The cron-entry parameter in the event timer cron command specifies that the applet is run one minute after 9AM or 5PM (the reverse time/date order makes it particularly confusing) on every day of every month (the two asterisks) but only on weekdays (the 1-5 parameter for the day-of-week). I've decided to create two EEM applets to be able to perform different actions on the start/stop events. If you don't need that functionality, just merge them into a single applet; the cron-entry then becomes "1 9,17 * * 1-5". The various models you can use to run OSPF over partially-meshed WAN (usually Frame Relay) are complex enough to make you scream ... or switch to EIGRP :) Arden Packeer did an excellent job in his three-part tutorial describing broadcast and non-broadcast network types, point-to-multipoint network type and point-to-point links over Frame Relay. If you still have problems with OSPF after reading all three tutorials, use point-to-point subinterfaces. I've finally found the EEM reference documentation that specifies the side effects (changes in environment variables) of all action commands. You can use the changed environment variables in subsequent action commands by prefixing the variable name with the $ sign (similar to the EEM applet where I've included router's name in an outgoing e-mail). Routing protocol redistribution is one of those tough Cisco IOS topics that everyone struggles with sooner or later. To ease your path to mastering the redistribution issues, Petr Lapuhkov wrote two articles: the theory of route redistribution and a simple case study. If you're a Cisco partner, you can start any of the listed lab exercises simply by clicking on its name and supplying your CCO username/password when asked for it by Cisco authentication web page. Everyone else can buy the same labs from our learning store. For example, for €120, you can get a one week unlimited access to the labs with the ability to repeat every exercise as ofter as you need. Do you need advanced knowledge and skills needed in designing and implementing core MPLS networks? We have developed exactly the course you need. The Building Core Networks with BGP, OSPF and MPLS (NIL_BCMPL) course focuses on MPLS applications such as MPLS VPN (with special attention to Internet access from a VPN), Any Transport over MPLS (AToM), Carrier Supporting Carrier (CsC) and MPLS Traffic Engineering (MPLS TE). As a prerequisite for MPLS deployment the routing protocols are explained as well - the Open Shortest Path First (OSPF) and Border Gateway Protocol (BGP). The scalability issues of the protocols as well as multiprotocol BGP are addressed as well. Several practice labs enable you to gain the necessary experience in deploying the MPLS-based core networks. It's well worth browsing through the list. I already had most of these sites in my feed reader and I've discovered a few new nuggets. BGP implementation on Cisco IOS gives you a number of filtering options, including prefix filters, AS path filters and route maps. While it might be tempting to learn just the most versatile tool available (route maps) and discard all the others, judicious use of all available tools can simplify your router configurations. For example, an Internet Service Provider might want to filter incoming updates received from the customers to ensure they’re not advertising transit routes and advertise only IP prefixes they actually own. Inbound route maps might also be needed to attach BGP communities to inbound routes or set BGP attributes (for example, local preference) based on communities attached to incoming routing updates. You can perform all these tasks with route-maps, but then you’d probably have to create a dedicated route-map for each customer (as the inbound prefix filter has to be customer-specific). Changing your routing policies or community definitions would require changing a lot of route maps. Use neighbor route-map in to drop prefixes belonging to your own address space, implement various routing policies and set BGP communities. The solution scales even better if you configure common filters (route-map in and filter-list in in our scenario) in a BGP peer session template. The short answer is no, unless you can differentiate legitimate users by their IP addresses. The port scanners (when using SYN scan) simply open and close a TCP session, and there is no way for a router to differentiate between the legitimate users (who would send valid HTTP GET requests) and port scanners (that would close the session as soon as it's established). If you can distinguish between legitimate users and everyone else based on their IP address, the task becomes simpler: either you apply inbound access list on Internet-facing interface of the router or configure per-service access-list (for example, ip http access-class acl). When using the inbound access-list, the port appears filtered or stealth, when configuring per-service access-class, it's reported as closed. To disable the automatic insertion of the connected host route, use the no peer neighbor-route interface configuration command. Sometimes it would be nice to have the full complement of Unix utilities available on Cisco IOS. That's not going to happen for a while, but we can use Tcl to make our life simpler in the meantime. Xavier Brouckaert, a regular contributor to my blog, has sent me the Tcl implementation of line counting utility (equivalent to wc -l on Unix). You can define the procedure interactively in Tclsh (but then you have to do it every time you start Tclsh) or you could store the code in a flash file and execute the file every time the Tclsh is started with the scripting tcl init filename global configuration command. Obviously you could turn this idea into a full-blown Tclsh script that would accept CLI arguments … but I'll leave this as an exercise for the readers (you can probably tell I've been reading some academic literature lately :). However, if you find the time to write a more complete wc implementation on IOS, please do post the URL here. Do you want to gain IPv6 configuration skills and test the associated routing protocols at the time that suits you most? The IPv6 e-course allows you to do just that. The IPv6 Fundamentals, Design and Deployment (IP6FD) e-course is a blended learning solution that consists of the IP6FD web-based training and associated remote lab bundle. The course provides you with knowledge and skills needed for transitioning to IPv6 based networks. The content encompasses design and security considerations, IPv6 configuration principles and IPv6 transition mechanisms. You will learn how to implement IPv6 in a network using numerous routing protocols such as RIP, EIGRP, OSPF, IS-IS and BGP, as well as hands-on skills in deploying IPv6 transition mechanisms including various types of tunnels. You can find additional e-courses in our catalog. In the Designing large-scale BGP networks article I wrote for SearchTelecom, I've described common BGP design techniques that you should consider when designing a large-scale BGP network. When trying to extract the OSPF route selection rules from RFC 2328, I've stumbled across a very weird rule (section 16.4.1): if an ASBR within a non-backbone area advertises an external route (or if the forwarding address is within the non-backbone area), it's preferred over external routes advertised by ASBRs in other areas regardless of its metric. I simply had to test this on Cisco IOS … and found out that Cisco engineers prefer common sense to OSPF RFC. Every now and then, EEM applets fail to recognize a new configuration prompt generated by the router and abort due to timeout (or hang-up forever if you're using IOS release prior to 12.4(15)T). You can use the new pattern keyword of the action cli configuration command to fix the bug. action 1.1 cli command "configure terminal"
action 1.2 cli command "ip dns view default"
action 1.3 cli command "dns forwarder 10.0.0.2"
:13.343: %HA_EM-6-LOG: Test : DEBUG(cli_lib) : : CTL : cli_open called. :13.519: %HA_EM-6-LOG: Test : DEBUG(cli_lib) : : OUT : Enter configuration commands, one per line. End with CNTL/Z. :33.403: %HA_EM-6-LOG: Test : DEBUG(cli_lib) : : CTL : cli_close called. action 1.2 cli command "ip dns view default" pattern "#"
action 1.3 cli command "dns forwarder 10.0.0.2" pattern "#"
If you need to improve your hands-on IPv6 skills and have access to Cisco's Partner Education Connection, you can get a number of IPv6 remote lab exercises free-of-charge. Everyone else can buy the same labs from our learning store. For example, for €128, you can get a one week unlimited access to the labs with the ability to repeat every exercise as ofter as you need. Would you like to use the Cisco Security Agent (CSA) v5.0 product to protect host systems from intrusions and security threats but don't have the time to attend classroom training? Do you want to prepare for the CCSP exam? Why won't you learn and practice configuration skills at your own pace in full control of your time? The Securing Hosts Using Cisco Security Agent (HIPS) e-course is a blended solution that consists of the HIPS web-based training and associated remote labs bundle. It takes a task-oriented approach to teaching the skills needed to deploy, configure, and administer CSA to protect server and workstation hosts. 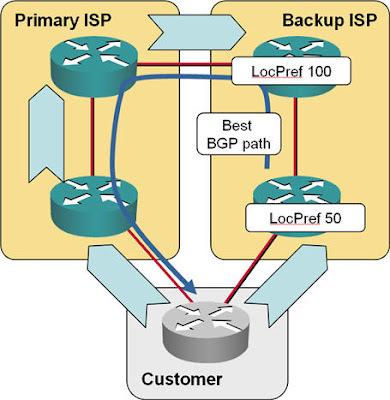 Enterprise networks primarily use BGP with their Internet Service Providers if they want to be multi-homed (connected to more than one ISP). A very common requirement in a multi-homed design is the primary/backup setup where the lower speed (or sometimes lower quality) link should only be used when the primary link fails. Today's check of who quotes (and who copies :) my content brought me a "hidden gem": I've discovered a web site that performs automatic translation between any pair of almost 30 languages. So, if you have nothing better to do and have already checked your daily Dilbert, here's something that will literally make you ROFL: use the machine translation of my blog posts (or any other web page that is technical enough to contain words with "unexpected" meanings) into various European languages. You could start from the form that appears on top of each translated page (just enter URL and select the target language) or you could try the BGP communities post translated into German for starters. But even if you speak no other language than English, don't despair ... this software does wonders in English-to-English translation as well. Check, for example, my When OSPF Becomes a Distance Vector Protocol post translated to English. It looks like there is a limit related to using the same access-list/class-map/policy-map on multiple interfaces. The first time I was applying the same policy-map (19 classes/19 ACLs/46 ACL lines) on all interfaces, but the switch would not accept it on more than 15 interfaces. Another test scenario had 18 classes/18 ACLs/52 ACL entries and the same policy-map would only work on 13 interfaces. Now we implemented 24 different policy-maps, class-maps and ACLs remained the same, and the switch is happy. Start IGP and find neighbors. Receive IGP updates and build the network topology. Start LDP and exchange labels for all prefixes in the network. Advertise router's presence in IGP. You can configure slow OSPF startup with the max-metric router-lsa on-startup seconds router configuration command. The corresponding IS-IS command is set-overload-bit on-startup seconds. Run SPF (at least the spf delay). Find LDP neighbors (at least the discovery hello interval). Exchange labels once the SPF run has completed. Unless you're under very rigid time constraints, 30 seconds seems like a reasonable delay in most environments. BGP communities are extra attributes you can attach to an IP route carried by BGP. You can use communities to indicate which routes should be propagated or filtered (for example, the well-known NO_EXPORT community signifies that the route it’s attached to shall not be sent outside of the local AS), to influence route selection on remote routers or to trigger other BGP-dependent IOS features (for example, quality-of-service marking based on BGP). Each BGP community is a 32-bit value. The best practice dictates that the top 16 bits should be the AS number of the network defining the community meaning and the bottom 16 bits are defined by the network administrator. For example, if you use BGP communities to control QoS marking within your network, the top 16 bits should be your AS number. If you’re using a BGP community to mark backup BGP routes before they are sent to your ISP, you should use the BGP community defined by your ISP (and thus the top 16 bits are the ISP’s AS number). The only mechanism to set BGP community in Cisco IOS is the set community command in a route-map. Important: The set community command erases existing communities attached to a route and replaces them with the new set of communities unless you specify the additive option. on routes redistributed into BGP with the redistribute route-map router configuration command. The BGP communities are transitive BGP attribute, meaning that they should be propagated to all BGP neighbors. Important: Cisco IOS does not propagate BGP communities unless you manually configure community propagation for each neighbor with the neighbor send-community configuration command. BGP peer groups or peer templates are an excellent way to configure BGP community propagation for a large number of peers. A while ago I've read an interesting post where Jeff Doyle, while describing his new-hire interview process, mentioned that inter-area OSPF is actually a distance vector routing protocol. At the time I found the argument interesting, but a bit academic. A few months later, I've experienced interesting routing flaps in one of my lab setups. A detailed investigation revealed that they were caused by Area Border Routers redistributing inter-area information back into the area from which it originated, effectively creating a temporary routing black hole. You can find the details, in-depth explanation as well as workaround solutions in my february IP Corner article When OSPF Becomes a Distance Vector Protocol.